50 Epic Things to Do in Bali - The Ultimate Bali Bucket List! How Is Long Term Travel Affecting My Mental Health?! 5 Things I Miss About Travelling In Asia…and 5 I REALLY Don’t! REVIEW: GoPro Hero 7 Black - Should You Buy It For Travel? REVIEW: The Stray New Zealand Bus – What’s It Really Like? REVIEW: Starling Bank – The Best Way To Manage Money Whilst Travelling? How To Travel The Maldives On A Budget – Exploring Paradise On The Cheap! How I Travel The World On £25 A Day & Tips So You Can Do It Too! The East Coast Of Australia, How Long Should You Take? The Sydney To Cairns (or other way around!) 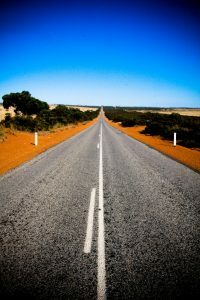 route is the mainstay of backpacking in Australia – with so many amazing place sin between it’s the perfect travel trail for those in search of sun, fun and adventure. But how long is best to spend on the East Coast? Well here’s my advice to you on how long to spend and what you can realistically achieve in any given time frame. The East Coast Australia Trail – It’s BIG! So What Do I Recommend?! This Isn’t A Short Trip! The first thing I should really mention is the fact that the distance between Sydney and Cairns is pretty damn sizeable – 2628km along the coastal route…which is about 31 hours of solid driving time! Alot of people seem to overlook the sheer scale of the route when planning – so it’s good to keep this in mind. To put it more into context I guess you probably wouldn’t want to spend more than 4 hours a day driving/travelling if you’re on holiday. So with that in mind it would take you just over a week to complete it all. …the times mounting up quickly hey?! It IS possible to do the entire route in 2 weeks – in fact many travel agencies in Australia sell such packages. In a super competitive market where budget is the main factor in any travellers decision making process they are also the cheapest options, which draws in many people. However I would NEVER recommend trying to complete the route in 2 weeks. It’s a ridiculous concept that will see you spending waaaaaay too many consecutive hours on buses, having an incredibly limited amount of time in each stop, passing by many amazing locations and just rushing it all. East Coast Australia is an incredible part of the world and something you should take your time exploring. …and then you’d also have 2 overnight buses in there too (Sydney to Byron Bay and Rainbow Beach to Airlie Beach) – not so brilliant hey?! Fond Memories Of East Coast Roadtripping! As you can see you get a lot more nights in places so the pace is slowed down heaps – and you can also fit in extra stops like Yamba and Magnetic Island. This also give allows you to budget in Sydney and Cairns into the mix too. I’ve left a couple days to play with that you can slot in whenever or extend your Cairns stay to fit in an open water dive course on the Great Barrier Reef or even a couple days further north in Cape Tribulation. For a bit of an added extra you could also cut out one of the nights in Airlie Beach or disregard Magnetic Island and fit Melbourne into it too. I know a lot of people only have 4 weeks to play with when travelling Australia – so I put together a post on How To Spend 1 Month In Australia which contains a full itinerary including bus times to help you out! Roadtripping To With My Buddies! For me 6 weeks is the ideal amount of time to spend on the East Coast. It gives you plenty of extra time to really break everything up and have some serious down time. You can also easily fit Melbourne into the mix too as it’s only a short flight or overnight bus to connect from Melbourne to Sydney and then head upwards up the coast. Stop wise basically just pad out the 4 week trip with longer stop overs really! You certainly have the scope to add in extra like Cape Tribulation (just above Cairns) and even break up the Sydney to Byron leg with spots like Coffs Harbour. The best advice with 6 weeks though is the fact you know you have a solid amount of time – maybe don’t even make a plan and see where it leads you! Kick Back, Relax And Enjoy! If you’re heading out to Australia on a working holiday visa then you’ve potentially got a year to play with which is awesome! This is going to allow you to bounce around, backtrack, change plans, basically do whatever you want. Leave if you don’t like a place, stay until you get bored if you enjoy another! If you do have 12 months though two words of advice – don’t smash out the whole coast in one shot quickly just because you can. If you like somewhere, stay and work to top up the funds. Move on when it feels right. 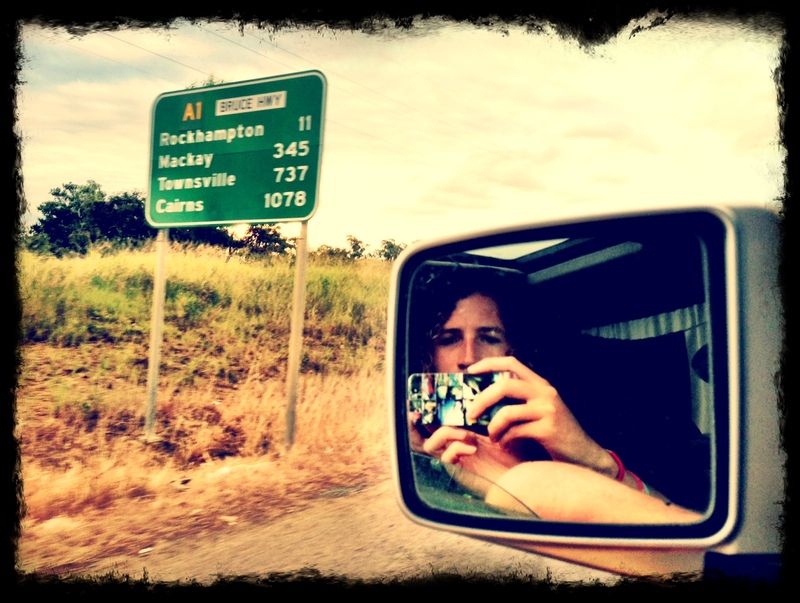 I spent over 6 months in Byron Bay before exploring anywhere further north than Noosa. Do I have any regrets? Nope! I loved that place! The other word of advice – why just the East Coast? Western Australia is a bit more off the backpacker trail and there’s heaps to do, so there’s no reason to constrain yourself to the East Coast trail simply because that’s where everyone else seems to be heading! Bottom line is – the more time you have the better! Obviously time constraints and budgets come into it but try not to rush if you can help it. It’s better to spend a bit more time and money and do it properly than to leave Australia feeling like you rushed it and didnt get the most out of this wonderful country. If you need any other help planning check out my East Coast Mini guide and Australia Monthly Budget posts for tips on how to make the most of the land down under. 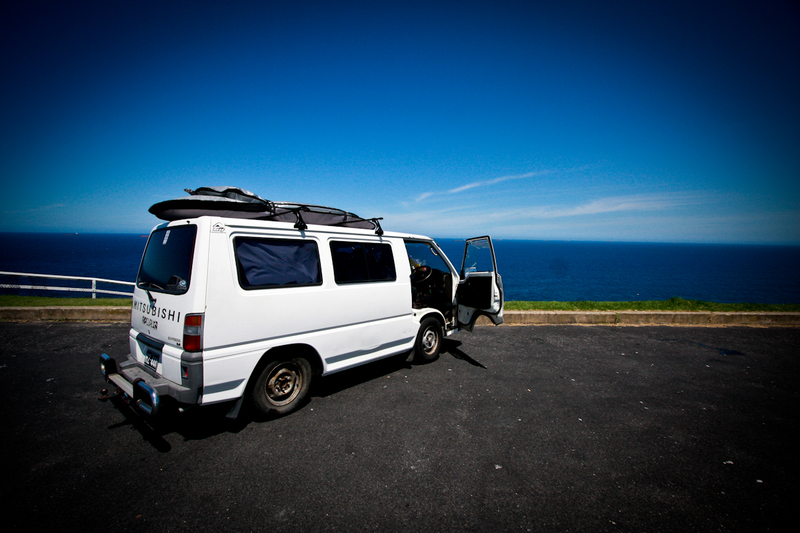 Make sure you check out some of the awesome East Coast Australia Packages over at RTW Backpackers too or customise your own East Coast Package! Have you hit up the East Coast Trail? Anything you’d add in about time and stops? For more info on where to head on the East Coast check out this post. 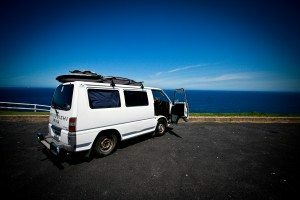 For more info on the best way to travel the East Coast of Australia check out this post. Definitely one to bookmark. I love itinerary and planning help! Glad it could help Rachel! Glad you agree Stef. The longer the better hey? You’ll have heaps of fun Holly! I’m travelling the east coast on Monday for three weeks. Can’t wait!!!! Yeeewwwww enjoy Trish – great time of year to visit! How much do you think you should budget for say, 8 weeks sydney to cairns not leaving anything out and plenty of drinking? any guesstimates would be appreciated! 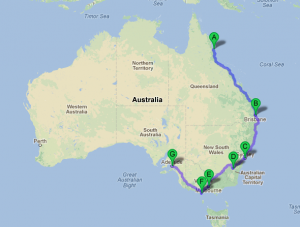 I´m going to do this trip from Cairns to Sydney this year! Very excited already. We are 2 and we will start at the end of July….and that leads me to my question now. 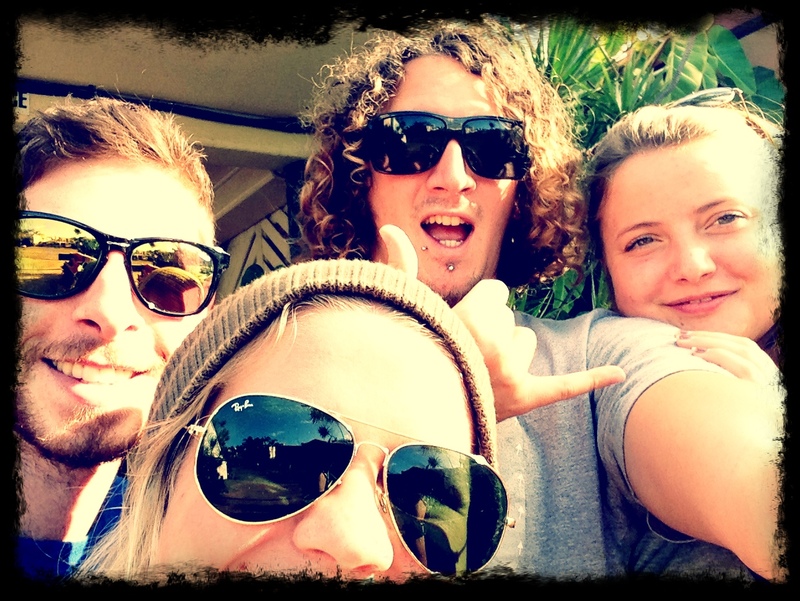 Stoked to hear you’re heading out to tackle the East Coast – love that part of the world! Winter varies along the coast, I won’t lie Sydney could be pretty cold, but Cairns is going to be pretty hot! It might rain a bit, but it’ll still be pretty warm around Queensland! You’ll have a blast! Hi Chris, thanks so much for all of your Australia advice! I have used it as the basis for planning my upcoming trip. One question for you – I am travelling the East Coast mid December- mid Jan which I understand is quite a peak time. I am travelling alone so keen to meet new people and continue my journey with new friends, however a lot of the hostels you recommend already seem to be booked up around Christmas and New Year! Is it best to pre-book hostels and trips at this time of year or wing it? Hey Lydia, stoked to hear about your trip! Indeed that’s peak season so it’s best to pre book if you can, or at least a few days in advance especially for key parts like xmas/new year and the week after new year as thats when a lot of people are moving around in the same direction! What would be your budget for the 4 weeks option? Me and ma boi are looking to hit up the East-Coast, we know we want to start at Adelaide and also visit Melbourne, Sydney, Fraser Island, Byron Bay and Cairns. Any other suggestions that will make our trip the best? And if you’re looking to get some stuff booked up check out RTWBackpackers.com – let me know if you’d like some discount codes! I am planning the east coast trip second week of January, we end start in cairns and make out way down to Melbourne. Flights are booked! But now that I am planning I am reading that January is one of the worst months due to the weather. Did I make a mistake going in January?? :( also any suggestions for the great barrier reef, we are divers and would like the best experience since we may never be back at the barrier reef again. Stoked to hear you’re heading to Australia – you’ll love it out here! Hmmmm weather wise how long are you spending between the two? If it’s over a couple of months or so it might be worth grabbing a cheap internal flight down to Melbourne and working your way up so you follow the best of the weather as Feb/March Melbourne starts cooling down. That being said slightly lower season means cheaper prices and less crowds! If you’re diver I also highly recommend diving in Byron Bay – during summer months its a great spot for Manta Rays and Leopard Sharks! Again let me know if you want any discounts! Hi Chris! Im looking to do the east coast in 16 days. Ill be flying from cairns to brisbane, then driving from brisbane down to Melbourne, partly on the GOR, and then flying from Melbourne to Adelaide where Im living while on exchange. Could you give me a schedule breakdown similar to that in your article of where I should stay and for how long given my current time restraints? Id appreciate it! I will be booking the 30 day tour so hostels and transport is included. I will just be paying for additional activities, eating and drinking. Would you say £60 GBP would be per day? So yes £60 per day for additional activities, eating and drinking should cover you easily – although that obviously depends what activities! chuck me an email on [email protected] if you have any questions! Hi Joey – check out my other site RTWBackpackers.com and drop me an email – I can hook you up with some awesome tour deals! Hello Chris! I will be going to traveling from Melbourne to Cairns in Australia. I will be flying in from New Zealand on September 25th. I was thinking of spending 3-4 weeks and would like to end my trip with a Great Barrier Reef activity in Cairns before leaving to England. Any advice on a good 3 week itinerary for Melbourne to Cairns as I’d to minimize my budget and time but without rushing too much. Any advice for the Great Barrier Reef exploration would be greatly appreciated as well. Thanks for your help! For the Great Barrier Reef I’d recommend the guys from Deep Sea Divers Den – I’ve used them for a few years now and always have a blast! If you have any other questions let me know and I’d be happy to help! hey there – awesome post I love reading your stuff its always so helpful ! I’m am looking for some advice though if you can help me…I land in Sydney on the 8th March ’18 and my flight to NZ from Melbourne leaves on the 14th May so I essentially have just over 9 weeks travel time: this is where it gets tricky: given the seasons / months I’m there would you recommend I made my way up from Sydney to Cairns then took a direct flight to Melbourne to spend my last week before heading to NZ or would you land in Sydney, spend a week there then fly to cairns and make your way down the east coast to Melbourne ? I’ve been toying with the idea of both now for so long I figured you might have some advice for me I’m so stuck haha! Stoked to hear about your East Coast plans and good work with the 9 week plan…plenty of time t enjoy everything! Personally I’d go for the third option – land in Sydney, spend some time there then head to Melbourne for a week before flying over to Byron Bay from there (either Ballina, Gold Coast or Brisbane Airport) and then head up to Cairns. The reason I suggest this is you’re finishing up in May which is pretty much Aussie winter…and yes Australian can actually get a bit cold, especially in Melbourne! So doing your Melbourne part at the start will mean you get the best of the weather down there and can then follow the summer up the coast! Plus that means you can just grab a Brisbane > Cairns Greyhound Pass which saves you $100 and includes the leg from Byron > Brisbane for free! I hope that helps! 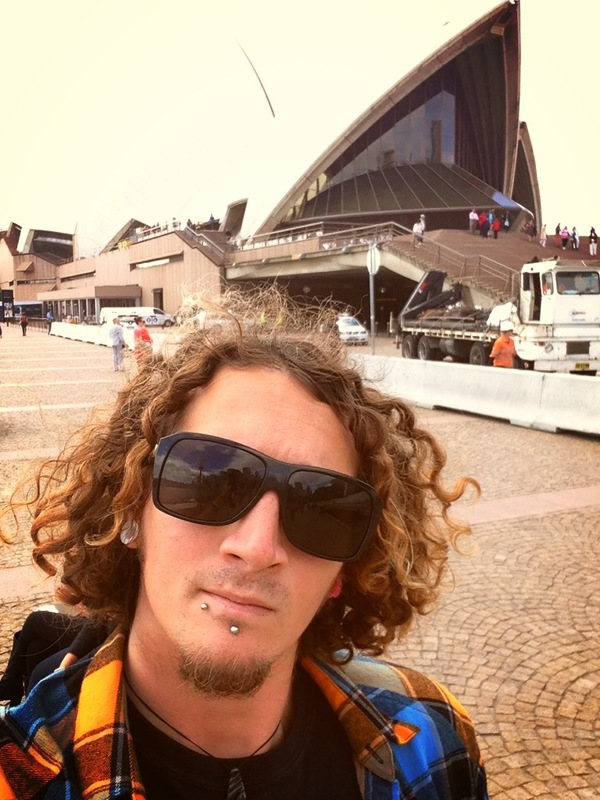 Also check out my other site RTWBackpackers.com which specialises in Oz and NZ travel and drop me an email – I’ll hook you up with some discounts and help plan your trip if you want! 50 Epic Things to Do in Bali – The Ultimate Bali Bucket List! 7 Epic Things To Do In Cape Town – Tried & Tested!